YANGON—China is looking to make further inroads into Myanmar’s economy by funding a US$1.5-billion elevated railway project in the country’s commercial capital, Yangon. China Railway Eryuan Engineering Group Co., Ltd (CREEC) made a presentation about its planned project to develop an elevated railway to lawmakers in a media room in the regional parliament on Monday. Under the proposed project, CREEC will build the 37.9 kilometer-long elevated railroad with 24 stations in two to three years. The company said it will fund the project, which is estimated to cost $1.5 billion, but asked for a 50-year contract to operate the service, according to MPs who were at the presentation meeting. Regional lawmaker U Than Naing Oo from Panbedan Township told The Irrawaddy that lawmakers raised the issue of the region’s ongoing problems with land seizures and confiscations, and disagreed with the company’s plan to develop an alternative route instead of connecting with the city’s existing circular railway. The Ministry of Transport and Communications is upgrading Yangon’s circular railway line with the help of Japan International Cooperation Agency. The upgrade includes modernizing the line’s stations, tracks and trains. Management expects to finish the project in 2023. Some 73,000 commuters ride the line daily. U Than Naing Oo said CREEC expects the rail line to serve some 400,000 commuters daily. It proposed two lines: one from Kyeemyindaing to Mingalardon and another from North Okkala’s Kyauk Yay Twinn to Yangon International Airport. He said the 50-year term would need to be considered, as Parliament is reviewing long-term projects approved in the past. 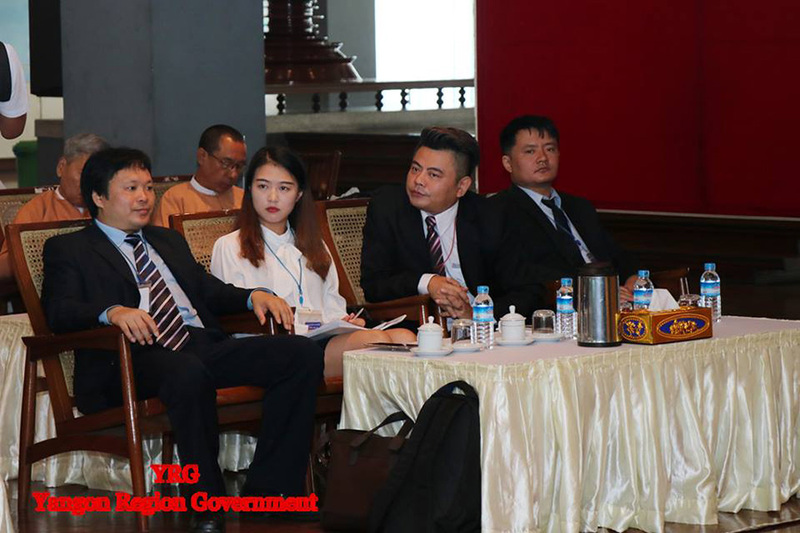 Yangon Region Investment Monitoring Team chairwoman Naw Pan Thinzar Myo, who is also the region’s Karen ethnic affairs minister, and Yangon Region Parliament deputy speaker U Lin Naing Myint were also present at the meeting. According to lawmaker U Than Naing Oo, Naw Pan Thinzar Myo said the regional government basically agreed with the proposed project, as the government wouldn’t need to fund it or obtain loans. However, for final approval, the minister said the plan would be submitted to the ruling National League for Democracy’s economic committee and to the Union Government for review, the lawmaker added. Prior to holding its first presentation about the project for lawmakers on Monday, the company met and discussed the issue with regional government officials in late 2018. Regional lawmaker U Yan Aung from Mingalar Taung Nyunt Township said he heard that companies from other countries are also interested in developing the elevated railway and are preparing to present their plans to the regional chief minister. “We welcome competition. Officials, including [we lawmakers], can decide which will be the best option for the public,” he said. In November last year Hong Kong-listed China Communications Construction Co. Ltd finalized its proposal for the development of $1.5 billion (2.4 trillion kyats) worth of initial infrastructure for the controversial “New Yangon City” project to the west of the Yangon River.